1 at home to Stoke. The Midlands club have not won three home matches in a row since 2007 - something which has contributed to their failure to break into the top six in the last three years. Vlaar is confident Villa can pick themselves up again from the Stoke defeat, but he still knows there is plenty of room for improvement. "If the discipline and the effort we had last week (against Chelsea) drops by only one per cent, and if the focus is not right - I'm not saying it wasn't right (against Stoke) but it has to be spot on - then we are not as good as we think," the Villa captain told AVTV. Christian Benteke got Villa off to a perfect start when he fired the hosts ahead in the fifth minute, but a series of defensive lapses allowed Stoke to cruise to only their second away win of the season. 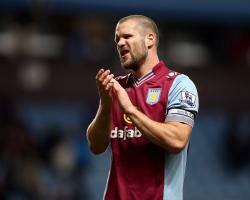 Vlaar wants to move on quickly from the defeat, which caused Paul Lambert's side to slip into the bottom half of the table. "We have to get rid of games like this and learn," the Dutchman said. But we have come back and stepped up again, and we have to do it again." Lambert was unhappy with the "lethargic" effort of his players, but given that Villa are nine points above the relegation zone, he was loathe to complain too much. The Scot thinks his players may actually fare better against Manchester United next weekend. "Whatever happened in this game, Old Trafford would take care of itself," he said. "Manchester United is a great game to play in and a great stadium to go to. But we will go up there and try to get a result."